As populations rise and the demand for goods follows suit, industrial sectors across South East Asia and Oceania are booming. As some of the region's most successful businesses grow, demand is skyrocketing for storage solutions that enables responsive agile supply and supports high scale growth in today's global marketplace. As populations rise and the demand for goods follows suit, industrial sectors across South East Asia and Oceania are booming. As some of the region’s most successful businesses grow, demand is skyrocketing for storage solutions that enables responsive agile supply and supports high scale growth in today’s global marketplace. Naturally with this boom comes increased pressure on existing resources; none more than land. The business challenge of today is to make existing assets work harder or to future-proof new investments, as sourcing additional space is often an expensive and somewhat impossible exercise to effectively achieve. With this in mind, the time has come where expansion must go upwards, not outwards. Anticipating this need Dexion, the market leading storage and material handling solutions company innovated to introduce a new product range designed to directly address this problem, the Dexion 808. Dexion knows that for clients to maintain market-share and achieve growth, logistical efficiency is key. Their latest innovation, the 808, was designed specifically with high-bay warehouses, automatic shuttle systems, and mezzanine floors in mind. Future-focused, the 808 rack structure can climb to a note worthy 60 metres, a world record in terms of ASRS racking. The product’s ethos is to safeguard client’s future warehouse plans so that growth can be achieved with ease and confidence. With a multi-million dollar investment behind the R&D of 808, it’s clear the Dexion team means business on a global scale. 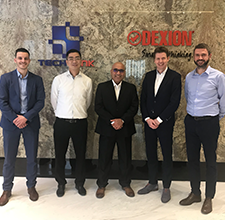 “While the height is impressive, it’s the large profiles carrying significant loads with great accuracy that makes 808 a game-changer,” said Dexion Regional General Manager for Australia & Hong Kong, Stuart Macnab. “The development of and R&D invested in the Dexion 808 was a direct response to the changing needs of today’s market. Buildings are growing taller and we saw the need to create a solution that upheld our philosophies of safety, but pushed the boundaries of high rise racking. “When you think about our products, we have a solution that is light in weight and can reach heights of up to 60metres and lengths of up to 200metres. You don’t see this type of infrastructure elsewhere unless we’re talking aircraft or marine construction. When you consider this you see how much the storage industry is an engineering game and how important it is to invest in a product that will last and grow with the business. Anything less is a gamble,” added Mr Macnab. Prior to 808, vertical storage was historically limited to approximately 12 metres of stacking. To achieve additional height, customers were reverting to crane implications while others were simply pushing the limits of standard equipment ““ a dangerous and often risky gamble when dealing with valuable goods and the safety of employees. “The 808 product line is our vision for the future. 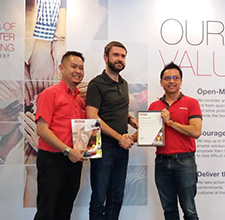 We now see this solution as an enabler as it allows customers to do more with their warehouses than they could have ever imagined,” said Mr Macnab. “When you consider the potential size of an 808 structure, it’s actually a feat of engineering. The number and precise placement of holes punched is within a remarkable 0.1mm, it is this that allows us to achieve such significant heights. Founded on innovation, Dexion has over 70 years of industry-leading innovation to its name. Currently working with businesses across Australia, New Zealand, Asia, and the Middle East, Dexion is the go-to creator of solutions that improve business functionality for the long-term. As with all Dexion solutions, the 808 been independently tested by specialist structural engineers at leading Australian universities and global consulting engineers. Dexion also offers full product engineering certification and detailed traceability, which underpins the product’s structural integrity and the safety of any installation. Fully bolted system, profiles can be manufactured with continuously punched holes (50mm pitch) or manufactured with the holes punched at specifically required positions. Flexible design options and application of components in solution design with Automated Storage and Retrieval System (ASRS), High Bay Racking, Rack Clad and Mezzanine Floors. Dexion Mezzanine Floors provide cost and space efficiency which conventional structures lack. Dexion Mezzanine floors are flexible, offering the ability to transport and relocate the existing floors. In high seismic zones, the project solution is tailor-made to the region to provide customers with added assurance and safety. Meets local critical design criteria such as wind and rain loads, crane forces, seismic considerations, soil types and robustness factors. Offers a wide selection of profile ranges and gauges to suit various applications.